PURCHASE 'Radio Da Da/The Teenage Tapes' by Mats/Morgan @ AMAZON (digital & physical): http://www.amazon.com/Radio-Da-The-Teenage-Tapes/dp/B00BSE4EPO WAYSIDE (physical - ships worldwide): http://www.waysidemusic.com/Music-Products/MatsMorgan---Radio-Da-DaThe-Teenage-Tapes-2-x-CDs__Rune-spc-362-363.aspx ITUNES (digital): https://itunes.apple.com/us/album/radio-da-da-the-teenage-tapes/id651714254 BANDCAMP (hi-fi digital): http://cuneiformrecords.bandcamp.com/album/radio-da-da-the-teenage-tapes Swedish collective Mats/Morgan—also known as the Mats/Morgan Band—occupy, or more aptly, create their own sphere in the transcontinental music scene, a zone wherein progressive rock, jazz-rock fusion, experimental rock, electronica, and progressive pop overlap and intertwine. The double-CD set Radio Da Da/The Teenage Tapes compiles Mats/Morgan’s earliest works but with a difference: These albums have been lovingly remixed, remastered, resequenced, and overdubbed by Morgan Ågren himself—they are virtually new offerings. Recorded in 1992 (Radio Da Da) and the years 1981-2008 (The Teenage Tapes), this compendium captures Mats/Morgan to some extent in embryonic phases, yet there’s nothing tentative or unfinished about its contents. Everything comes from someplace, and the genre-defying breadth of styles, bracing ideas, and high level of musicianship will appeal to both longtime followers of the group and neophytes, as well as fans of prog-rock and experimental rock in general. Co-led by Swedish musicians Mats Öberg (keyboards) and Morgan Ågren (drums), Mats/Morgan remain one of the longest-running European bands (30 years!) in the sometimes-overlapping spheres of jazz fusion and progressive rock. The Mats/Morgan Band has released ten albums and played countless concerts and music festivals. Each has successful parallel careers as leaders and collaborators in a wide range of contexts. An internationally acclaimed drummer, Morgan frequently rates highly in drummers’ magazines’ polls worldwide. Morgan is one-third of a power-improv trio with Raoul Bjorkenheim and Bill Laswell that performs at festivals worldwide and recorded the album Blixt, a thorny, cathartic set released on Cuneiform in 2011. Öberg has performed and recorded with players the caliber of Denny Walley, the Nederlands Philharmonisch Orkest, and Bengt Berger’s Beches Brew. 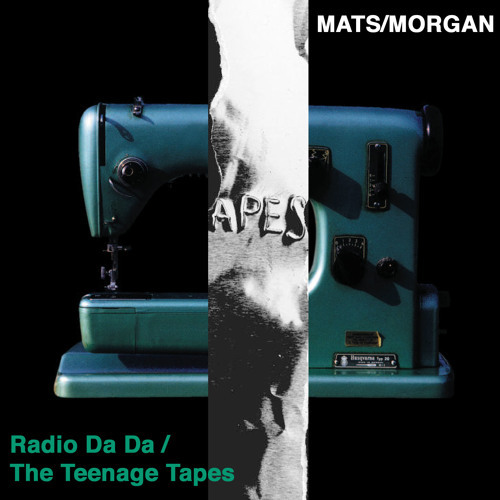 Its sixth Mats/Morgan release, a two-disc set entitled Radio Da Da / The Teenage Tapes. This double-disc marks the American debut of Mats/Morgan’s second and third albums, both originally self-released in Sweden in 1998. Radio Da Da and The Teenage Tapes, augmented with previously unreleased material. On Disc One, Radio Da Da is Mats and Morgan performing nearly all instruments and vocals plus contributions from Thordson, Mussa, Jimmy Ågren, and more, augmented by two extra tracks. The brisk, snappy “Sigfrid” begins with some bracing Terry Riley/Phillip Glass minimalism before segueing into some searing, soaring keys-flights evocative of early electric-era Return To Forever. “Täljes Logan” and “Djungle Man” are likely inspired by Zappa’s more satirical songs, contrasting deceptively sweet melody with comically caustic dissonance, while “Kul I Parken” with its backwards melody, crisp percussion, and pulsing melodic motifs imparts a nightmarish, Tim Burton-like tone. Disc Two: Teenage Tapes, which compiled the duo’s earliest works, including home and DIY recordings from as early as 1981. While the original Tapes contained 29 tracks, this edition has been expanded to 36 [!] tracks to include recordings up to and including 2008. Tapes seems relatively rough-hewn compared to Radio Da Da, yet never amateurish. Indeed, The Teenage Tapes finds the duo wise beyond their years, presenting playfully grandiose textures (the elemental, fugue-like “JP3”), thorny fusion, dream-pop interludes (“Wanna Dance?”), and gothic bebop (“Bandet Gär”). “Chicken Pie” pays tribute to the flamboyant proto-prog of Yes and Genesis while “Basflarp” is a stirring slice of Scandinavian funk, Billy Cobham and Stanley Clarke carving a niche in the Arctic Circle. While Teenage Tapes presents a band still finding its way, combining razor-sharp instrumental acumen with a puckish sense of humor, seeds of forthcoming greatness are already evident. “Bombonk” finds these youths blending the whimsical and the nightmarish with equal aplomb. “Foxtrot” (a nod to Genesis?) evokes post-Discipline King Crimson. With the release of the double-CD Radio Da Da / Teenage Tapes, fans and novices will be able to go “forward” with Mats/Morgan in terms of a “new” opus to relish by jumping headfirst into the past via these hitherto-unheard (outside of Sweden) albums. Devotees of Rock In Opposition, the “old-school” prog of the Canterbury bands, fusion, and even commercial powerhouses Yes and Brand X will find vistas a-plenty to cherish.